When my mom comes in town to visit, one of our her favorite places to visit is Costco. She doesn’t have a store local to where she lives, so whenever we go together, we cruise the aisles, two carts deep, overflowing our buggies with all the random, fun things the warehouse is carrying for the month. This past weekend during her visit, to my delight and of all the random goodness to find, they had a big bin filled with sheepskins. There were literal happy dances taking place in the middle of the store. My love affair with sheepskins started last year when I found one for the heart to cozy up the living room for fall (you can check out my fall home tour HERE). 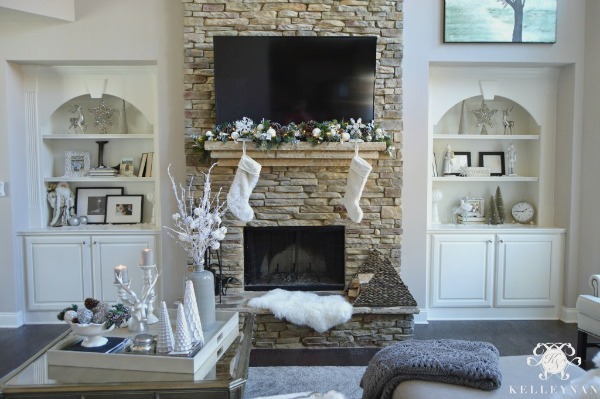 And then, it of course transitioned into winter (you can check out my Christmas home tour HERE). Then, when all the Christmas decor was packed up and put away, I couldn’t part with the fur. In fact, I moved it into the sitting room and went out and purchased another small skin for my bedroom. 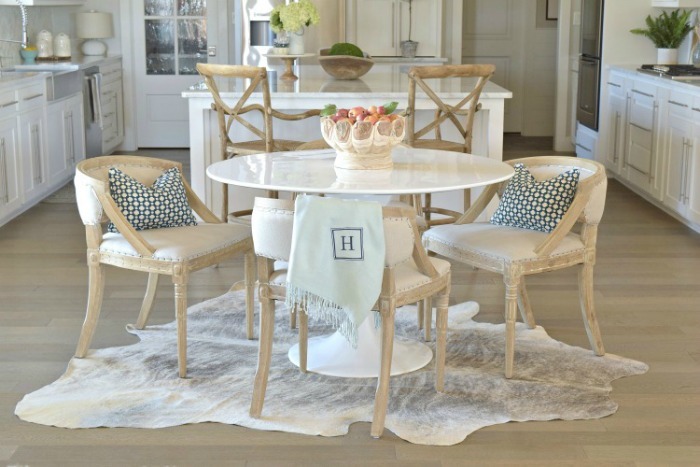 Its perfect to layer on top of stools, chairs, or ottomans, but I have been wanting to add a larger one as a rug in the little sitting area of our master retreat. It is far from finished but Costco must have known that it was time for me to add a little more to this space because I didn’t have to think twice about bringing this baby home. 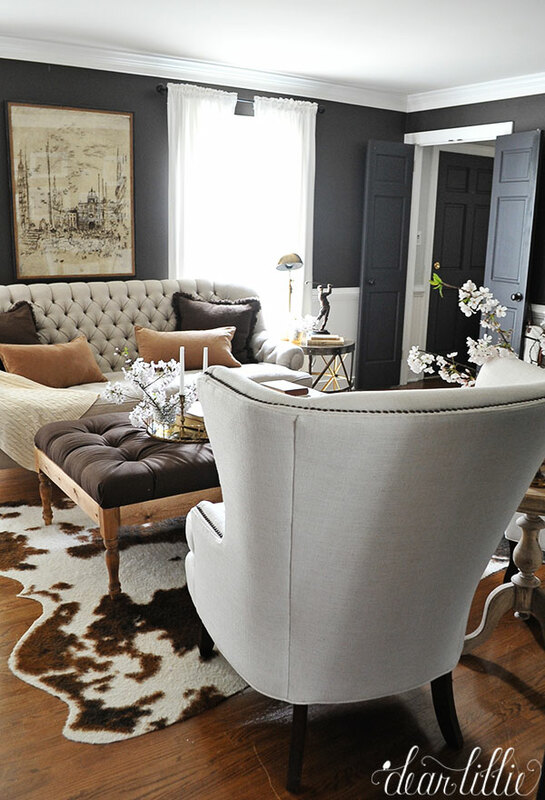 So now that I have three sheepskins, I have my eyes set on adopting a cowhide to add to one of our rooms. 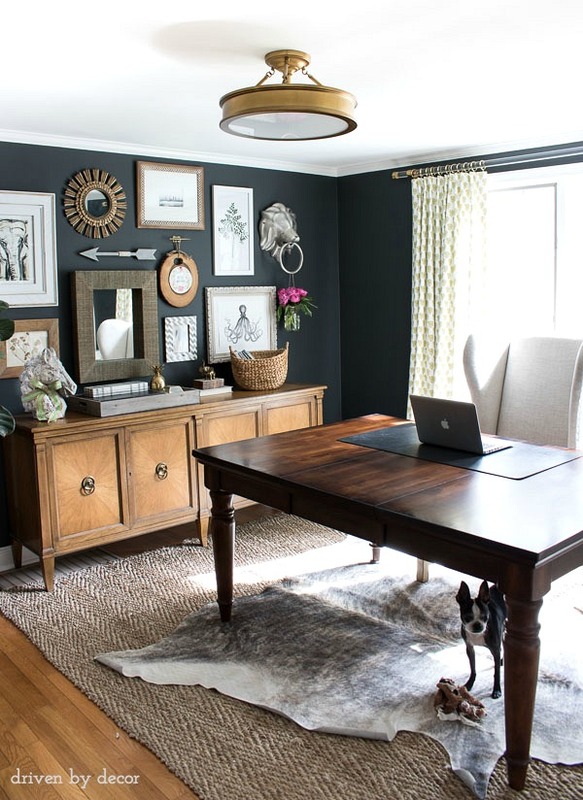 I haven’t decided where just yet, but today, I have rounded up some of my favorite inspiration for hides and skins and ways to incorporate them into a variety of rooms. Are you a little color/pattern shy? Jennifer at Dimples and Tangles is an expert in creating a bold look with traditional elements. And, being brave enough to let the leopards and cows play together totally pays off here! 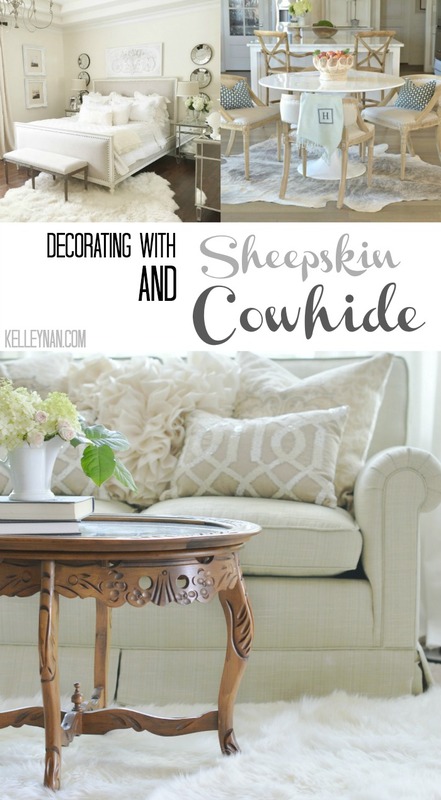 And, in addition to the cowhide she uses in her living area, be sure to check out some of the others she uses throughout her home. 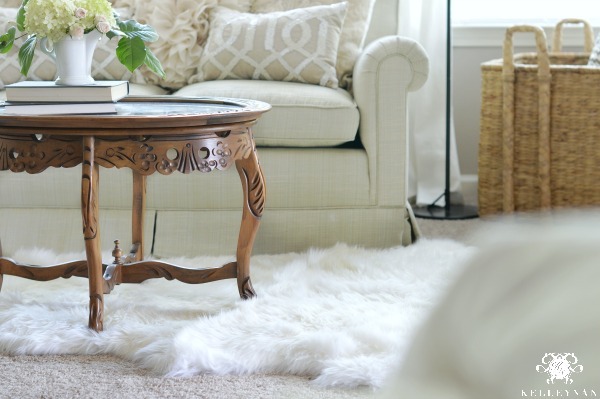 Something I love about sheepskin is that it is a way to use a neutral, solid color without being “boring”. All that texture can translate to elegance or even a little funk depending on where you use it. Randi of Randi Garrett Design has a sheepskin in her romantic master retreat that has basically become famous on Instagram. 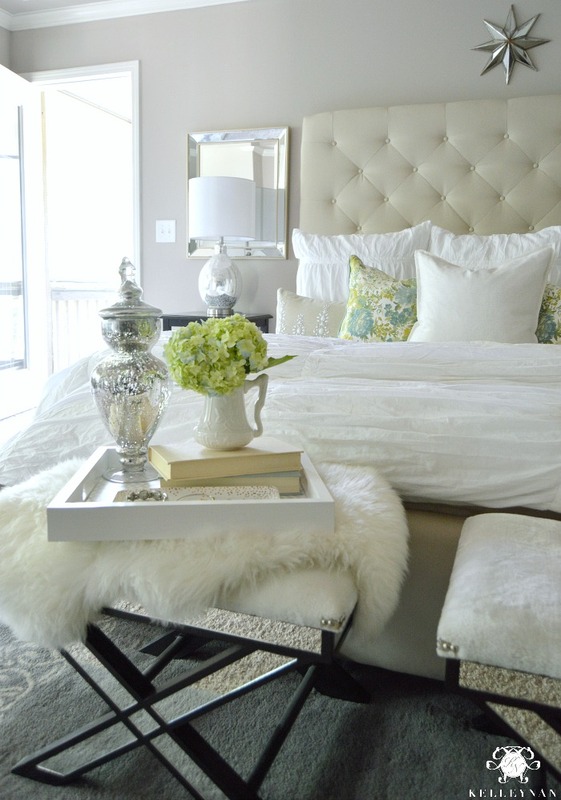 Between the plush bedding and the sumptuous rug, these layers couldn’t be more cozy. I admire the incredible transitional style of Bree at Z Design at Home and the hide she chose for her kitchen perfectly marries those traditional and modern elements. Also, I kind of just want to crawl underneath her cutie tulip table and lay there. 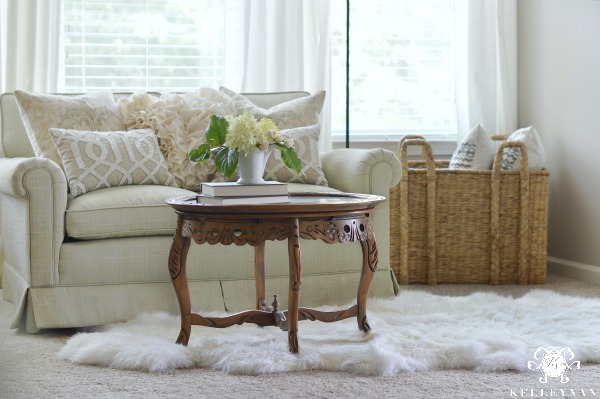 If you have a space with the question of “do I use a circular rug or a rectangular rug?”, an interesting shaped animal hide can take out the guess work. I was recently asked if you can mix gray and brown. I immediately replied “yes!” as I have done so throughout my own home and am drawn to rooms with those tones used together. This unexpected bit of fun in Jenni of Dear Lillie‘s den makes for the most awesome incorporation of pattern to ground out this gorgeous room design. Are you convinced yet? You don’t have to have a western/lodge style home to bring some animal to your space. If you are looking for that special something to cozy up or bring a little “fun” to your room, try one of these easy options for a big statement. You can shop some of these favorites in all different sizes by clicking on the image. Great post! I too have a love affair with sheepskin rugs! I have 2, and I use both of them as throws. The big one on our seen-better-days cream leather sofa, and the smaller on a wing chair in my office. They both create an instant feel of luxury, warmth and sumptuousness. I love the look of a cowhide layered on top of a sisal rug- but I find they are just a tad too realistic looking for my animal-loving heart, regardless of being faux😂 I just know that every time I look at it I’ll just see a cow on my floor! Looovvve Randi’s luscious bedroom! I originally had my large sheepskin in the same spot as her, but I freaked out whenever anyone walked on it! I wonder if she leaves it down all the time, do you in your sitting room? I guess it would depend on how much traffic it would get and this area of our bedroom gets alot. Great post Kel! I love how everyone has incorporated them into their spaces! Fabulous! Great post Kelley! I love seeing pieces in multiple places in your home! What a beautiful post! I have a few cheapie sheepskin “rugs”, but yours look so luxurious I think I need one of those in my life! 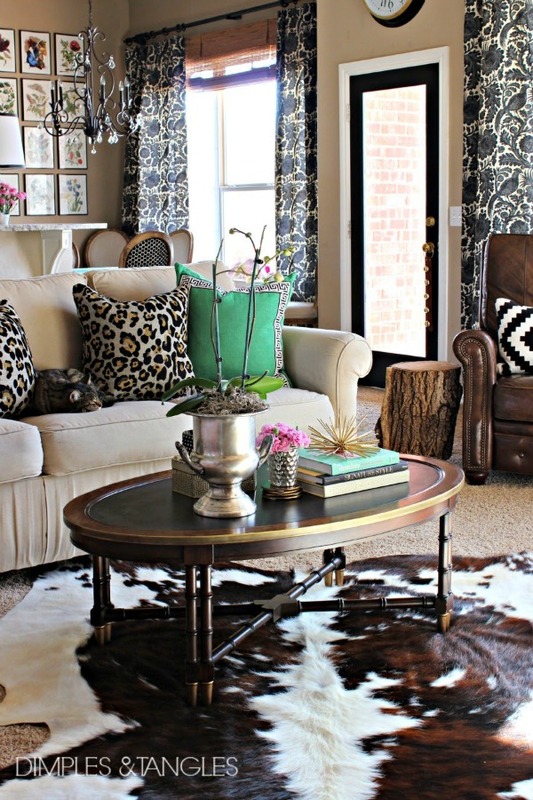 Thanks so much for including my cowhide rug. I own two… would it be weird if I’d still like to have another? 🙂 Love them! Enjoy your weekend! Jennifer, not at all! I couldn’t decide which of yours to use; you have them both in the PERFECT spots! Not being critical because I think your rooms are lovely, but I just can’t use any kind of animal skins in my house. I just picture the animal being alive and can’t support an industry that kills an animal for human ego (not quite the right word, but I’m sure you get my gist). 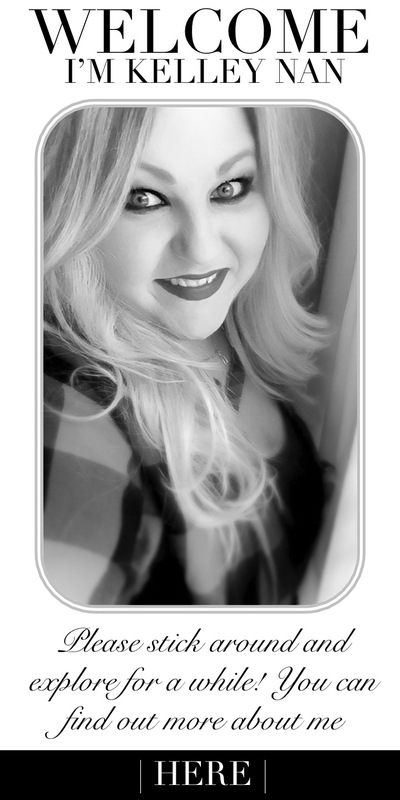 I could do faux, but just not the real thing. I never forget the Twighlight episode (many years ago) where a man was sitting in his den surrounded by the heads of big game animals he has killed over the years. They all came back to life and devoured him! Hi, Jaynez. I absolutely understand. There are some lovely alternatives, also. One thing I do like is that unlike furs which are farmed specifically for their fur, the majority of skins are manufactured as animal byproduct that is already produced for food. I so appreciate you stopping by and know that there are many others who share your sentiment. 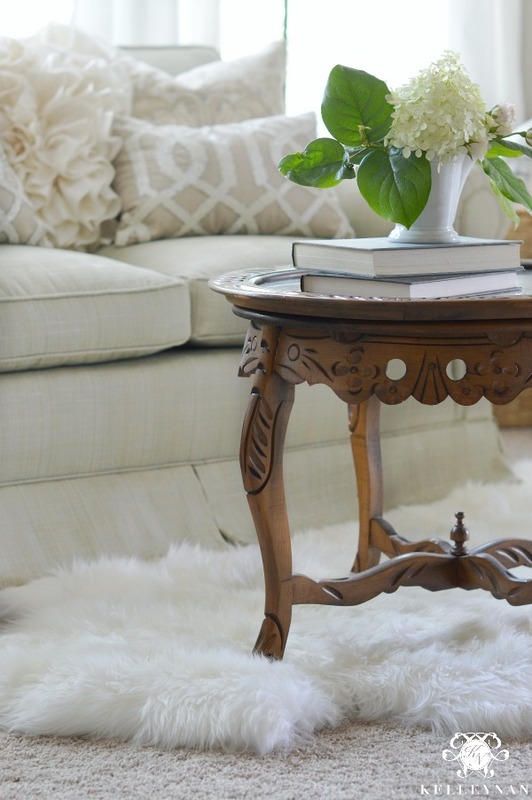 I love the look of sheepskin rugs and the warmth that they provide, especially on cold winter mornings. I would love to have one by my bed to step on to every morning. I like how you point out that it is a great way to use a neutral without sacrificing texture or style. My only question is how hard are they to keep clean? Thanks for all this inspiration! Hi, April: I totally agree! I keep mine in low traffic areas and they have not been difficult to maintain. Thank you so much for visiting! Wow, these designs are so chic! I didn’t think you could make a cowhide look so elegant. I’ll be honest, I thought it would look trashy and ugly. I am pleasantly surprised and I think I am going to try it in my home. Thanks a bunch! Aimee, I love the look too! Crazy how many different designs you can use them in! Were did you get your pillows that are on your sofa.